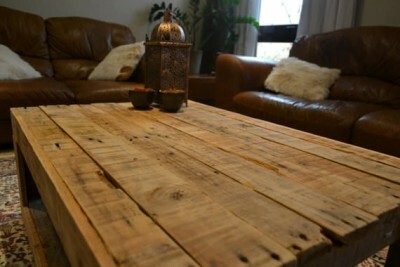 This rustic table, suitable even for hight standing living rooms, is completely built using pallets, specifically the planks of several recycled pallets. If you observe in detail the table, you’ll see that the wooden planks are old and worn, and that’s precisely what gives to the table style and character, its rusticity. As you can see in the images that come with this post, the table fits well in a living room of classic decor, where the materials that form the furniture are from noble origin, such as the leather or the wood, and the decorative objects are from an antique shop . As we have mentioned before, the table was made entirely using pallet planks. First we must find a suitable pallet to build a furniture of these features, matured thanks to the passage of time, giving to the wood ocher colors and waters, with cracks and rusted nails. Once we have these pallets we must disassemble them to obtain the planks that will build the table, be careful when you detach them, the wood may be rotten and could be broken quite easily. With the design of the table already in mind, it’s time to start joining the planks to mount it, if you decide to make a table of classic uniform lines like the one on this post, the table will fit perfectly into any decor, even the most elegant. It’s interesting to build the furniture with certain irregularities, for example the planks should not fit perfectly between them, this will give to the furniture a great character. In the next picture you can see this detail at the perimeter of the table top.